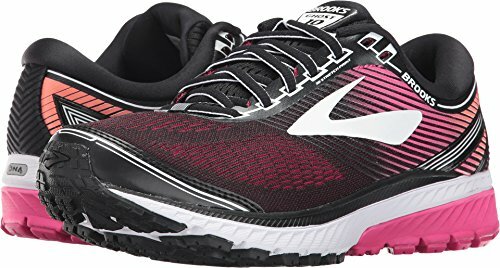 Brooks Women's Ghost 10 Black/Pink Peacock/Living Coral 8 B US | What Should I Say? Get lost in your thoughts with a smooth and well-cushioned ride in the Brooks® Ghost 10. Predecessor: Ghost 9. Support Type: Neutral. Cushioning: High energizing cushioning. Surface: Road. Differential: 12mm. Offers medium to high arch support. The Black/Turquoise/Purple color style is in collaboration with the 2018 Special Olympics. Engineered mesh upper provides breathability and needed stretch. Lightweight synthetic overlays. Traditional lace-up closure. Plush tongue and collar. Soft fabric lining for a great in-shoe feel. Removable foam insole. BioMoGo DNA is a blend of earth-friendly BioMoGo and responsive Brooks DNA, and has a gender-friendly cushioning design, making for a dynamic ride. Full-length Segmented Crash Pad accommodates any foot landing and sets the foot up for smoother transitions. Omega Flex Grooves allow for more natural forefoot movement and fluidity. Soft blown rubber forefoot material supplies light cushioning and grip. Imported. Measurements: Weight: 9 oz Product measurements were taken using size 8.5, width B - Medium. Please note that measurements may vary by size. Weight of footwear is based on a single item, not a pair.